Natural order, the interconnectedness of being, is evident in the lives and ways of the honeybee. Inspired by Apis mellifera, (Latin for honey makers), and jolted by their startling demise, I devote my MFA thesis work to the bee and its culture. Evidence of holistic existence of the hive engages all of our senses and can inspire a deepening of perception. Thousands of individual bees’ lives produce a living organism, a hive; the many combine to create the whole. My senses of smell, sight, and hearing are stimulated when in the presence of a live colony of bees, evoking response from deep memory and influencing me to create work that follows a circuitous route much like the bee on its quest for pollen. 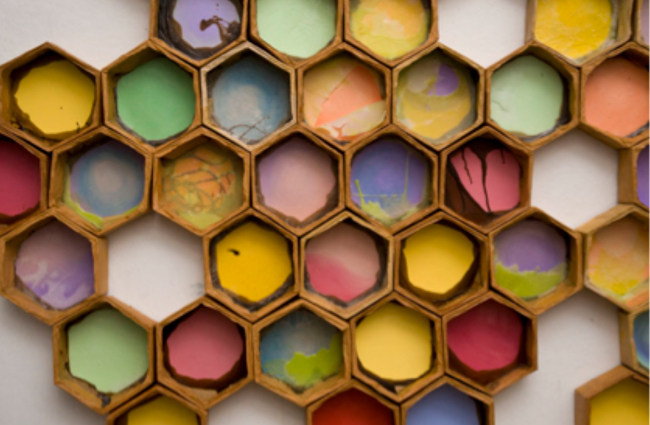 Focusing on the bee provides rich ground for artwork that grows in many directions, that is multidisciplinary and experimental. Within the web of the natural world, bees and humans have been interrelated for millennia. While today beekeeping is big business, a standardized, mechanized industry, I’ve noticed among small and backyard beekeepers a common deep affection for “their” bees, a remaining trace of this ancient relationship. Many beekeepers are using respectful and reverent ways to work with honey- makers. In the spring of 2007 I contacted such a beekeeper, Ron Breland, and visited his apiary in Nyack, New York. Nestled in a garden of wild flowers and organic vegetables was a group of stacked, hexagonally-shaped boxes containing hives. The scene reminded me of gnome dwellings, where sprites visit among the hum of bees and vegetation dappled with sunlight amidst a rainbow of colored blossoms. Ron opened an inactive hive and drew out honeycomb that bees had made unhampered by the typical confines of today’s rectangular shelf method. The sight was so surprising it took my breath away. I experienced a moment when thought was suspended, and it affected me deeply. My reaction was cellular and animated an exploration of the physicality of the comb and its raw sculptural beauty. After visiting Breland’s apiary, I returned to my work with heightened enthusiasm and respect for the example of wholeness in the natural system of the honey bee. 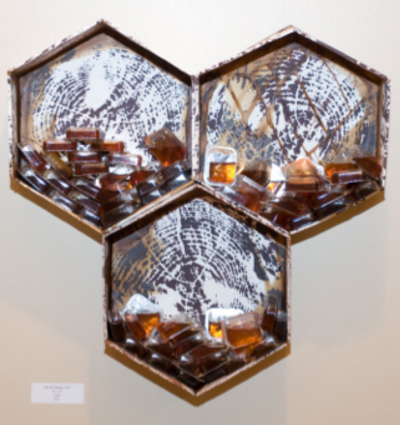 Hexagons with Packets is a statement about the ill ways honeybees are exploited. Huge monocrops, like almond trees in California, depend on so many more bees than naturally exist in the area for pollination that beekeepers truck thousands of hives across the country to attempt to do the job. Staggering profits are at stake agriculturally with the bee an integral part of the chain. The boxes are made from heavy paper, covered with mono prints from tree stumps, and filled with plastic packets containing honey. Mass-produced, disposable, with non-decomposing packaging, consumption of plastic packets of honey can be seen as a metaphor for the contemporary use of honey and life. What was revered by and sacred to our ancestors is now widely seen as a disposable commodity; we perceive a disconnection between material and spirit. 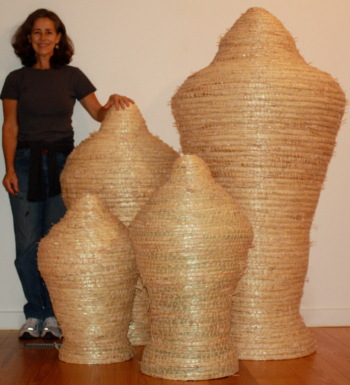 Susan Bradley: As a graduate student at The Hartford Art School, University of Hartford, Suan focused on ideas and imagery inspired by the hive and the honeybee. Using a variety of methods and materials she continues to explore this rich topic steeped in ancient history, mythology and spirituality. Her life and work continue to be influenced by the bee and a heightened awareness of the interconnectedness of all.